Initiation to training step by step (instructions included inside toy). All parrots love to insert objects inside other objects. It is a natural game to them. The goal here is to teach them to do it on COMMAND. The Teach Box is rewarding for the bird because it is easy to do. 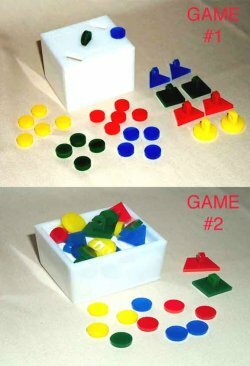 The Teach Box includes Disks and coins. 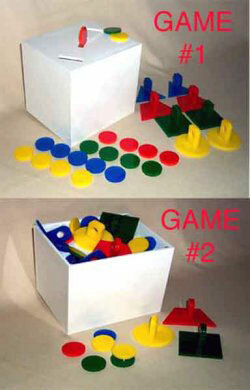 As you will notice, the game box opens on top, there is no bottom. 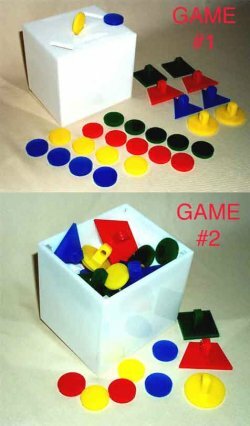 The Teach Box is, in fact, two games in one. The Teach Box is a game of introduction to training. With this game, the bird "learns how to learn" and gives you the opportunity to learn with him with the ritual of the "training session" (see preparation sheet included). Your bird will expect to learn and play each time you install him on the training table. What a great way to spend time with your FIDs and with 3 sizes, no BIRDIE is left out! Joanie has sent us a video of her Moluccan Cockatoo, Spencer, who can teach us a few things about putting the parts into the box! What a Clever boy, Spencer is! Thanks for sharing, Joanie!